Usain Bolt lost one of his nine Olympic gold medals Wednesday when the International Olympic Committee stripped Jamaica of their 4x100m relay win at the 2008 Beijing Games after a team-mate was caught doping. It is the result of retesting of hundreds of samples from the Beijing Games and means that Bolt — who had previously described the prospect as “heartbreaking” — loses one of the three gold medals he won at that Olympics. Bolt‘s relay team-mate Nesta Carter, who ran the first leg of the race, was found to have tested positive for the banned substance methylhexaneamine, which was once used in nasal decongestants but now is more commonly found as an ingredient in dietary supplements. Last year, warned of the case against Carter, Bolt said: “It’s heartbreaking because over the years you’ve worked hard to accumulate gold medals and work hard to be a champion -– but it’s just one of those things. “Things happen in life so when it’s confirmed or whatever, if I need to give back my gold medal I’d have to give it back, it’s not a problem for me,” Bolt said, while praising the World Anti-Doping Agency (WADA) and the IAAF for their efforts to stamp out doping. An IOC statement said re-analysis of the 2008 samples of Carter, 31, “resulted in a positive test for the prohibited substance methylhexaneamine”. The IOC Disciplinary Commission ruled that Carter “is found to have committed an anti-doping rule violation pursuant to the IOC Anti-Doping Rules applicable to the Games of the XXIX Olympiad in Beijing in 2008”. 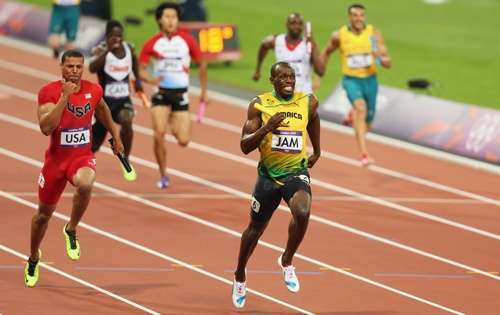 As such, he “is disqualified from the men’s 4x100m relay event” and must return his medal while the team — led by sprint king Bolt — is likewise disqualified and they must hand back their medals. Trinidad and Tobago, who came second, are promoted to gold medal winners, while Japan move up to silver and Brazil win bronze. The IOC said that Russia’s Tatiana Lebedeva, who won silver in the women’s triple jump event and long jump in 2008, had also been disqualified following re-analysis of her samples, which showed up positive for the steroid dehydrochlormethyltestosterone (turinabol), also on the banned list. “I received that information (she would lose her Beijing medals) a long ago, in the autumn,” she told Sport Express. “I can say for sure that I never intended to dope and I do not consider myself being guilty of cheating. “Of course, nobody has proof against accidental mistakes. But even if I made a mistake, it should be proved in court,” said Lebedeva, saying her lawyer was working on an appeal even if she rated her chances of succeeding as “minimal”. The IOC has been retesting hundreds of samples from Beijing 2008 and London 2012 as latest technology allows experts to detect new cases which were previously undetectable. In the case of relay events, if one member of the team is found to have used illegal substances, the whole team is stripped of their medals. To date, 1,243 samples from the Beijing and London Games have been re-analysed. Last month the IOC’s medical director Richard Budgett said he expected to see further cases of doping emerge from re-testing of London samples following 101 positive cases from those Games in 2016. On January 12, the IOC announced three Chinese weightlifting champions from the 2008 Games had tested positive for the banned GHRP-2, a human growth hormone. Following last month’s publication of the McLaren report into state doping in Russia the IOC indicated 32 Russian athletes who participated at the Sochi Winter Games in 2014 were facing a disciplinary procedure for alleged doping. Russia has denied state-sponsored doping. Referring to Lebedeva’s case, Russia’s Athletics Federation (RusAF) chief Dmitry Shlyakhtin regretted what he termed a “sad echo of the past”.